Trevor Hoffman is now officially part of the National Baseball Hall of Fame and during his induction speech, he summed up the journey he went on over the course of his professional career with a Bible verse. While speaking to family members, friends and fans who made the trip to Cooperstown, New York, Hoffman cited 2 Timothy 4:7, which reads, "I fought the good fight. I have finished the race and I have kept the faith." Hoffman revealed that the Bible verse was shared to him by a fellow former Major Leaguer, Mike Sweeney, back in 2010. He added that both he and Sweeney were able to leave the game of baseball "with no regrets." Earlier in his induction speech, Hoffman spoke lovingly of his deceased father who he believed at that time was smiling down on him from Heaven as he was receiving the highest honor that could be given to an MLB player. The 50-year-old former closer also talked about how his mother's words influenced his work ethic and how his brothers instilled in him lessons he would use to become a great player and teammate later in life. Hoffman also talked about the journey he took from being a "struggling shortstop" with the Cincinnati Reds when he was just getting started in pro ball to finally making it to the Hall of Fame as one of the greatest relief pitchers in the history of the sport. 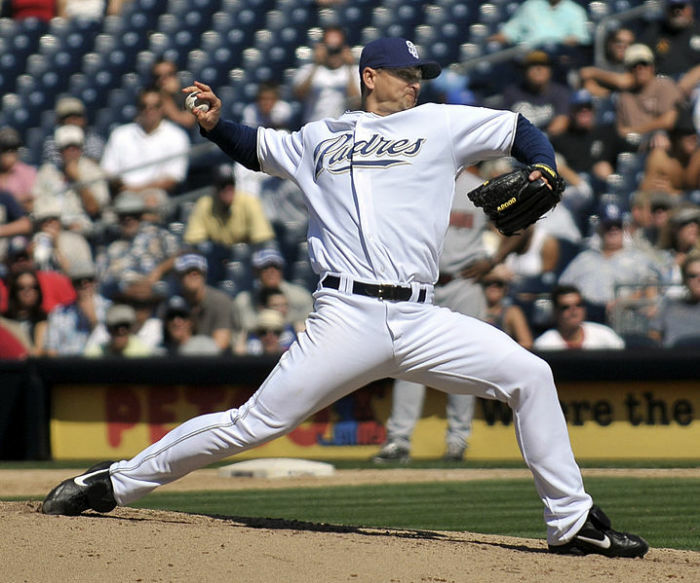 The newly-minted Hall of Famer made sure to thank his former teammates, the San Diego Padres and the Milwaukee Brewers and all the fans in attendance for making his stint in the Majors a memorable one. For the majority of his 18-year career, Hoffman was regarded as one of the best closers in the Majors. Hoffman pitched a total of 1089.1 innings in the Majors, striking out 1133 of the batters he faced. He also finished his career with an ERA of 2.87 and a WHIP (walks plus hits per innings pitched) of 1.058, according to Baseball Reference. He retired from the game with 601 career saves, which was good for the all-time record back in 2010. Hoffman has since ceded that record to the New York Yankees' Mariano Rivera, but the two of them are still the only members of the 600-save club. Along with Hoffman, other former Major Leaguers who were inducted into the Hall of Fame this past weekend were Vladimir Guerrero, Chipper Jones, Jack Morris, Jim Thome and Alan Trammell.